How to spice up your own homemade purées. As a trained chef and creator of Weelicious, a website (weelicious.com) dedicated to healthy eating for babies, toddlers and kids, I've learned that one of the easiest ways to add extra zip to homemade baby food is with herbs and spices. One of the first vegetables I offered my son, Kenya, was puréed butternut squash. Much to my chagrin, he rejected it on the first three tries. But on the fourth go-round, I added a pinch of pumpkin pie spice and, voilí ! He gobbled it up. Here, easy tips for making your own flavorful first foods. STAY AWAY FROM SALT AND SUGAR When your baby is first learning about new flavors and textures, between 4 months and 6 months of age, you want him to truly taste what he's eating. Avoid using salt and sugar to enhance the taste of food. START SIMPLE Once your baby is familiar with a new food, try adding one spice or herb to a fruit or vegetable purée (use organic produce whenever possible). For the most part, anything goes for this age group, but refrain from using strong spices, such as cayenne. You can use fresh or dried spices and herbs, but keep in mind that dried varieties are more concentrated and you'll need less to flavor a dish. BE CAUTIOUS Start by adding just a pinch of the spice or herb to the purée, and be sure to blend well; you don't want to overpower the food itself. CREATE PERFECT PAIRINGS Good combos include sweet potato and cinnamon; black beans and cilantro; butternut squash and nutmeg; peas and fresh mint; cauliflower and paprika; pears and ginger; carrots and cumin. 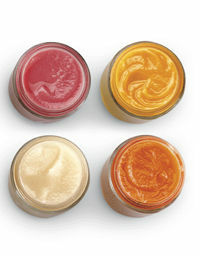 DIY MINI MEALS To make your own baby food, steam or roast organic fruit or vegetables. Let cool, then purée until smooth in a blender or food processor. Store in glass or BPA-free plastic containers for up to four days in the fridge, or three months in the freezer.